As the leaves change colors and the crisp cooler air of the fall replaces the warmth of summer days in the mid-west, we await the decisions that the American public will make on political representation in November. At this time, it is not clear what the NIH budget will be, but it is clear that there is a public outspokenness on government spending. It is times like these that the AFMR and sister organizations that advocate for the importance of biomedical research must make their impact to continue to impress upon our elected leaders and the public the importance of biomedical research on public health and well-being. The AFMR continues to advocate for biomedical research, the importance of physician scientists in biomedical research, and the career development of young investigators to feed the pipeline that has made biomedical research the success it has been in the USA. 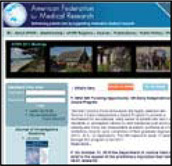 The AFMR by becoming a member of FASEB has a greater ability than ever to enhance these efforts. I encourage all of you to continue in your advocacy for research and mentoring of the next.